Galaxies are the largest formations or groups of individual stars that we know. All the stars we see in the night sky are part of a huge family of stars which form our galaxy called the Milky Way or the Galaxy (with a capital ‘G’). We see the nearest stars to us as individual stars but as we look at those further away they tend to merge into the fuzzy glow of the Milky Way. This effect is rather like standing in a pine wood, the trees nearest to us are individuals but in the distance they merge into a solid mass of trees. Looking out into space beyond our own galaxy we can see other galaxies of many different shapes and sizes. As amazing as it seems there are clusters of galaxies and even super clusters of clusters of galaxies. Galaxies can be seen stretching out into the universe as far as our most powerful telescopes can see. Our galaxy forms part of what is known as the ‘local group’ of galaxies comprised of about 30 members. 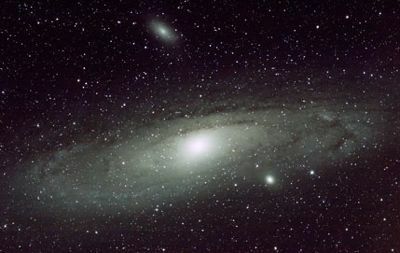 The local group is dominated by two large spiral type galaxies, ours and the Great Galaxy in the Constellation of Andromeda which can be seen with the naked eye on a very clear night. The Milky Way has more than 200 billion stars and the Andromeda galaxy is thought to be about twice the size with about 400 billion stars. 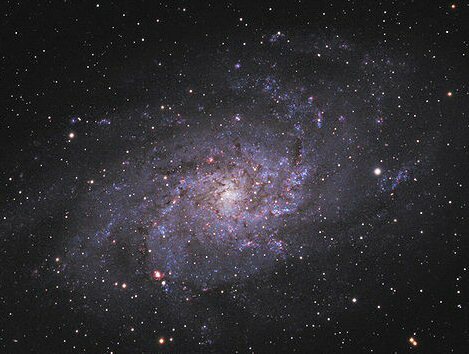 All the other members of the local group are smaller and many are located like satellites around the large spirals. Galaxies are classified into four types, these are Spiral, Barred Spiral, Elliptical and Irregular. Spiral and Barred Spiral galaxies are further divided into three subdivisions a, b and c depending on how tightly the arms are wound. They are therefore referred to as Sa, Sb and Sc or SBa, SBb and SBc. Elliptical galaxies have seven subdivisions ranging from E0 for those that appear round to E7 for those that are nearly cigar shaped. 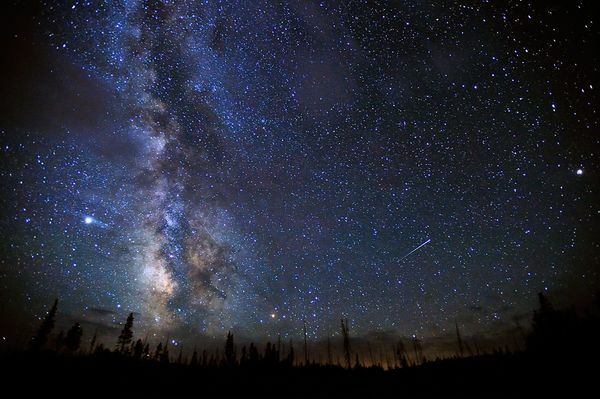 All the stars we can see in the sky even using a telescope are in our galaxy which we call the Milky Way. Our Sun is a single star which is one of about 200 billion other stars making up our galaxy. The Milky Way is a spiral galaxy which if we could see it from above would look like a Catherine Wheel or a whirlpool. Our position in the Milky way is on the edge of one of the spiral arms about two thirds of the way out from the centre of the galaxy, see the diagram below. There is a central ball of stars from which curved arms comprised of millions of stars extend. Galaxies are rather like islands of stars in the immense emptiness of space. Spirals are usually large and have a bright central ball of stars with curved arms spreading out from the ball to form a flat disc. Like our own galaxy ‘The Milky Way’, many galaxies other galaxies have spiral arms. Some have arms like curved spokes in a wheel some gently curved some tightly wrapped around the central ball. Others have what looks like a straight bar of stars extending out from the central ball with the spiral arms attached to ends of the bar, these are known as Barred Spiral Galaxies. 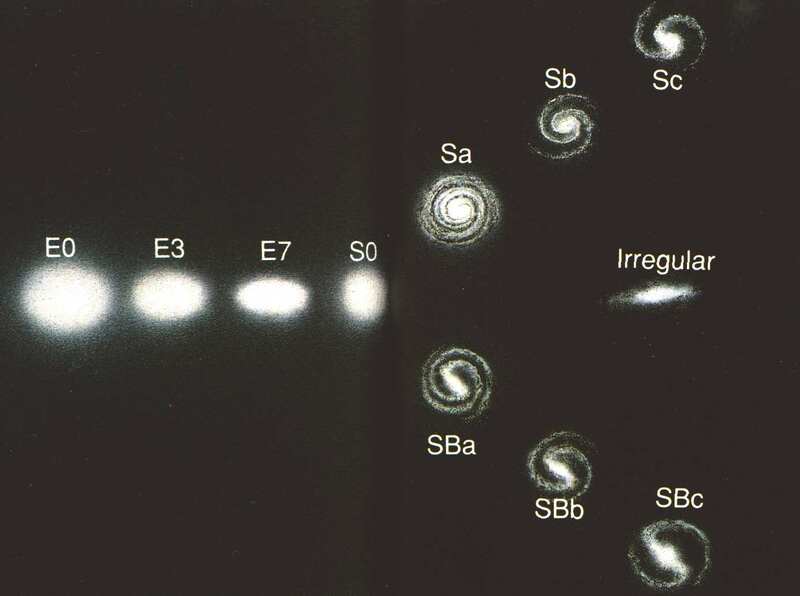 Spiral galaxies are classified as a, b or c depending on how tight the arms are wound preceded by S for Spiral and SB for barred. e.g. Sa or SBc. The Great Andromeda Spiral Galaxy is our closest spiral neighbour and can even be seen with the naked eye on a very clear night and from a dark location. These are huge balls of thousands of millions of stars. 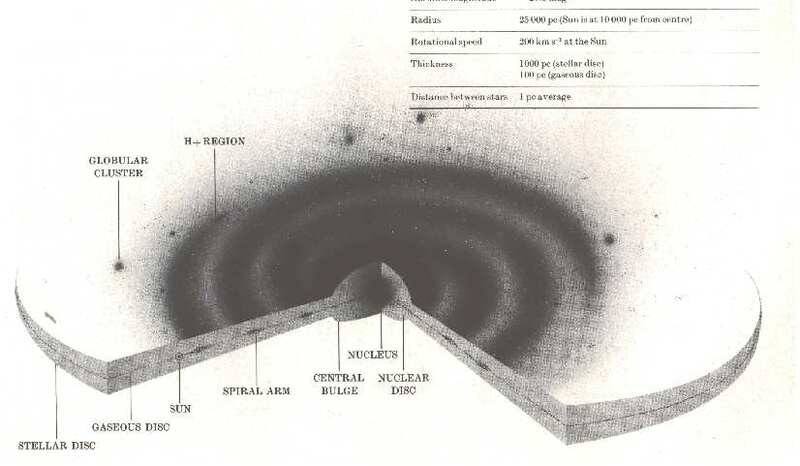 They do not have spiral arms but are elliptical (egg shaped). 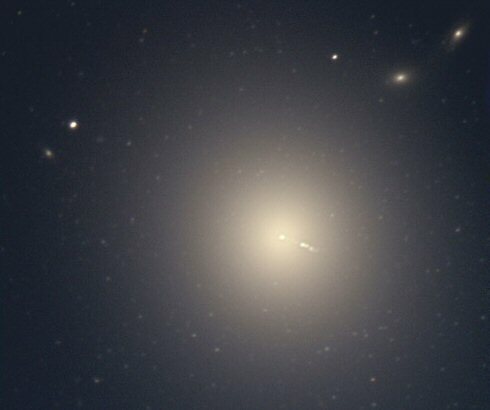 Many of these Elliptical Galaxies are the largest of all star groups, some having many hundreds of billions of stars and even up to a trillion stars. Elliptical Galaxies are classified according to how flattened they are, nearly round ones are known as E0 and sausage shaped ones E7. Most Elliptical Galaxies are very far away and therefore very faint and need a telescope to see them. There are some indications that the giant elliptical galaxies grew from the collision of two or more smaller galaxies. There are indeed some galaxies which can be seen in the process of colliding and possibly combining. These galaxies are as the name implies large groups of stars but with no classifiable shape, in other words they may be any shape. 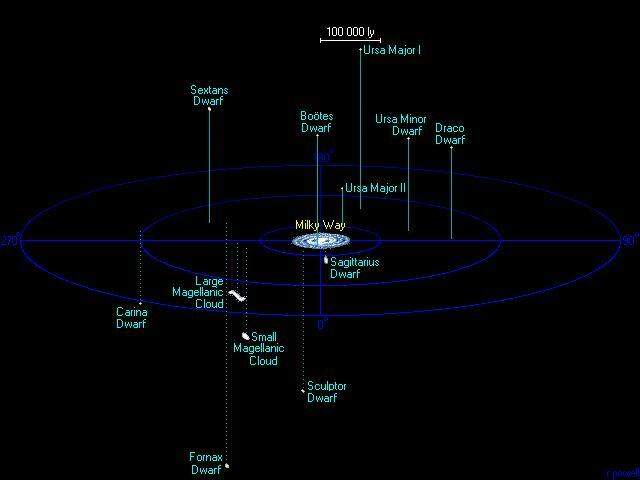 Our Milky Way Galaxy is one of the two main galaxies in what is known as the Local Group comprised of about 30 associated galaxies. Our spiral and the other spiral known as M31 or The Great Andromeda Spiral, have smaller irregular galaxies associated with them as satellite galaxies. 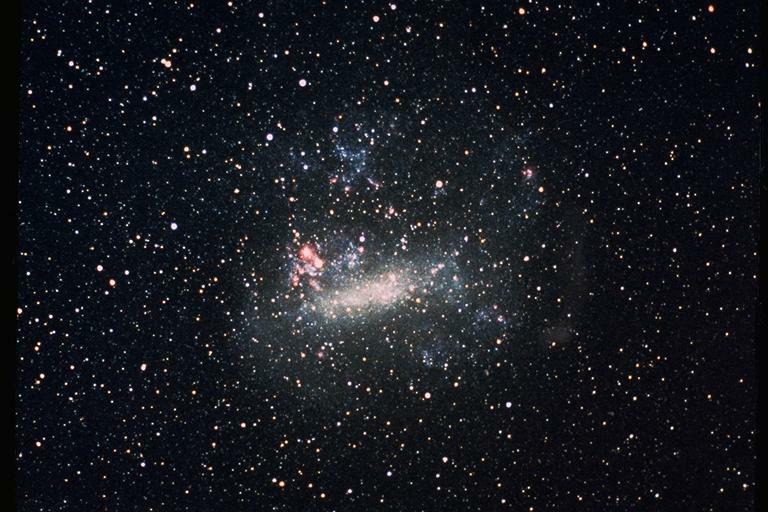 Ours can be seen from the southern hemisphere as islands broken off the Milky Way and are known as the Magellanic Clouds. We cannot see the Megellanic Clouds from Britain because they are too far south but are visible with the naked eye further south. Some large elliptical galaxies have huge numbers of satellite galaxies comprised of all the other types, forming a large family. It is thought that our galaxy may have as many as ten small irregular galaxies in attendance.